I was enjoying a quiet cup of tea on our back deck the other day when I felt it: The distinct sensation of six tiny feet scuttling across my skin. Sure enough, an ant had decided to traverse my mountainous foot instead of going around it like a sensible creature. That ant achieved low-earth orbit about a second later. 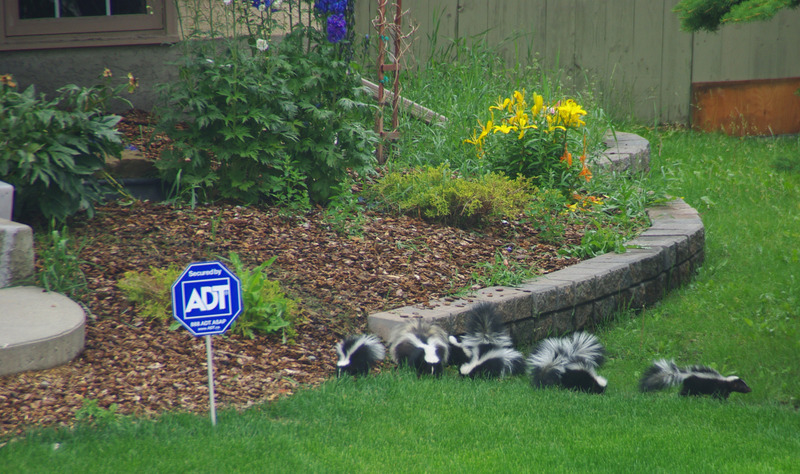 Mom and six baby skunks across the street from us – aren’t they adorable? But ants? Nope. That’s where I draw the line. Ants have no redeeming qualities. They bite, they eat house walls, they kill gardens, they make giant mounds in the lawn, and they multiply like crazy. Worst of all, ants are organized. And they outnumber us a million to one. That just doesn’t seem like a good ratio if they decide to band together and take over. I thought I was being overly paranoid with that particular speculation, but even the information pages mention the fearsome prospect of being conquered by giant mutated ants and their brutal slave-driving societies. Yikes. Thanks for a whole new batch of nightmare-fodder. And just to feed my worries, lately the ant population seems to have doubled in our yard. They’re slowly surrounding us, and I doubt their intentions are benign. I mean, seriously. Would you trust this face? We’ve tried ‘green’ commercial ant-killers with no success, along with all the home remedies ever suggested: vinegar, boric acid, boiling water, cornmeal; you name it. One thing we haven’t tried is casting the colony in molten aluminum. That’s a permanent solution to the problem, but it might be a bit hard on our lawn. They haven’t invaded our house en masse yet, so we’re maintaining an uneasy détente. Every now and then one sneaks inside and meets a prompt and messy demise; and every now and then they swarm me in my garden, doubtless hoping to return the favour. But if they ever mount a determined attack, I’m gonna up the anti-ant ante and get out the really nasty chemicals. ‘Cause the thought of being enslaved by giant mutant ants gives me the heeby-jeebies. And even heebier and jeebier… they can strip a dead gecko to bare bones in a little over 12 hours. That’s only a few thousand ants. Imagine what a million could do. 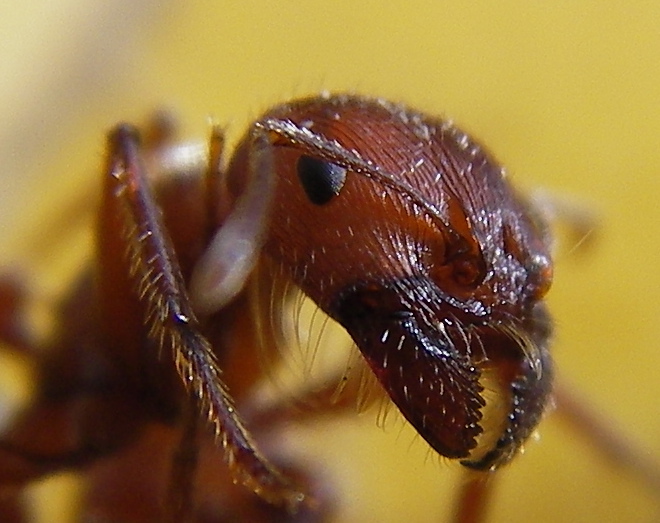 Did I mention there are approximately one million ants for every human on earth? Well, I won’t be sleeping tonight. What critter is your nemesis? New discussion over at the Virtual Backyard Book Club: What’s up with Stemp? Click here to have your say! Isn’t it funny how we each have our creep out line? Mine is mice and moths. And rats. (And bats, cuz bats are really just rats with wings.) But mice get me every time…and only field mice too, which is weird. Probably because they are so shifty and fast. I can hold a lab mouse in my hands, doesn’t freak me out at all, hamster, no problem. But field mice make me want to climb on chairs and scream for my husband. Do you have an erasure? LOL! I really wanted to work the phrase “auntie anti-ant ante” into this post somehow, but it just seemed like I was trying too hard. Love the picture of the skunks. It is now my wallpaper. Can I keep it? Ants around her are all tiny black critters. They have invaded our house to spend winters but Tanya is merciless. Oven cleaner works good. Spiders are to me what rats were to Winston Smith. I KNOW they are good and most are harmless but they are my phobia. I dunno; it seems to me that Winston Smith had pretty good reason to be phobic about rats. Rats themselves don’t bother me, but the prospect of being slowly eaten alive by them makes my mind run screaming to a safer, happier place. Brrrr! Okay, correct me if I’m wrong, but aren’t the giant mutations in movies usually caused by the really nasty chemicals used in insecticides and pesticides?? Something to think about……. Then there’s the radiation from a power plant meltdown or terrorist dirty bomb, don’t forget. But fair warning. That’s why I quit reading Tom Clancy. I got fed up with his exploding nukes in our cities and all that stuff. Haven’t touched one of his books in decades. Enough already. Thanks for the CANDU link. I had no idea they existed. I took a steam power plants course in school a hunnerd or two years ago, but the prof spent lots more time on coal- and natural gas-fired plants and the combustion dynamics thereof than nukes. Thanks again. You’re welcome! Most of the world doesn’t know much about CANDU reactors because most of the world “powers” don’t want them. Those guys aren’t looking for safe, reliable power; they’re looking for an excuse to collect enriched uranium for nukes under the guise of “we need it for our nuclear power plants”. CANDU reactors don’t need the enriched stuff, so there goes their built-in excuse. But maybe I’m just cynical… okay, that’s not a ‘maybe’. OMG! I HATE ALL creepy crawly insects and bugs!!!! I am such a “girl”!!!! LOL It’s why I don’t do much in the ‘great outdoors’. As long as they live outside, and don’t come into my home, we will be just fine. But once they cross into my area…they D.I.E.!!!!!!!!!!! But there are even KINGS of the evil bug world….and for ants it’s: The Jack Jumper. Enjoy….or not…. this is the stuff nightmares are made of! AAAAAH!!!! I’m never going to Tasmania. Never. And as to the ‘environmentally friendly’ method of catching them to collect their venom and then returning them to their nest? I dunno; I really try not to attract more bad karma than necessary in this life, but I think in their case I’d be willing to make an exception. Stomp ’em all flat! Three words: OH! HELL! NO!!! Tasmania is ‘WAY off my bucket list now. Keep your blogs coming. They start my day with a smile. Ants don’t bother me, but spiders……………………………. Thanks, Dorothy – I’m glad you got a smile! Spiders and I get along all right… as long as I remember to check under the outhouse seat before I sit down. That’s the only location where I really, really don’t want to encounter a spider! Well I’m still picking up my jaw off the floor from seeing the skunk family. Maybe you could invite them over to see what they might do about your ants? I have to admit that the chemicals have come into play when the ants try to move inside. I try to play nice for as long as I can but like you I don’t want to wake up with that face staring me down! We had problems with ants this year, too – not in the house, but in three huge anthills in our back yard. SO. MANY. ANTS. It was only a matter of time before they ran low on supplies and decided to visit us. Hubby did the chemical spray thing. I felt bad, but I felt better too. The old “cinnamon dusted on the door sill” just wasn’t going to cut it as a way to manage them. Steaks so tender the only time you needed a knife was to cut the bacon from around them. Absolutely fork tender. Exactly that way EVERY SINGLE TIME. Perfect. Prime beef, y’all. Try chalk. Ants will not cross a chalk line. You can draw a circle around a bunch of them and check it out. Any color chalk will do. Good luck,Genevieve OlivaHouston, Tx. What a visual! With her phobia, she’d use the pro sports chalk machine that groundskeepers use to re-mark the lines with on playing fields before games. From space, it’d look like a giant bullseye around her house..
Just don’t draw it with a 5 pointed star….you start adding pentagrams and there’s gonna be trouble. Did you have to go there, Diane? My ultimate nemesis….the ANT. No matter the size, color, or usual mode of being, any ant that comes into contact with me bites me. I’ve been freaked out by them since I was a teenager. My bedroom door had to be replaced and my dad the carpenter, had things in the backyard shed. Including a door. He installed it. A couple of days later, I notice this HUGE brown ant crawling on the door. I’m told…that’s a wood ant, just kill it or put it outside. They don’t hurt people, just wood. So I murderized it and thought no more about it. Couple days go by and….another couple of ants are crawling across the door. Dang it! So this type of thing went on for a couple of weeks and my nerves are fraying. Then one morning I woke up, turned my head on the pillow to look at the door and there is a HUGE BROWN ANT ON MY PILLOW COMING AT ME!!!!!!!! You know how cats can leap straight up in the air? Well, I think I’m part feline ’cause I did the same thing. I told my dad, it has to be the door, please remove it. He took it down, took it to the backyard and noticed there were some holes in the top and bottom of the supposedly solid door. He took a hose, inserted it and turned on the water. THOUSANDS of HUGE wood ants came pouring out. OMG!!! Ever since then, ants totally freak me out. Just the other day, I’m in my house, not doing anything to anyone and YOWZA! I didn’t see it as it was a mini-ant. But I sure felt the bite. They all hate me. And now, thanks to your wonderful piece, I will be having nightmares about them coming for me en masse. Next time, can you pick something else to write about? How about rabbits? My niece hates them but I love them. Yeah, write about Thumper, okay? Aaagh! That’s absolutely horrifying! Now I’m going to have nightmares, too. Brrrrr!!! Oh, crap! Fuzzy Bunny! No, no, no, let’s not write about them. Sheesh! Their visual in my brain is NO bunnies, which is why I usually forget their name. LOL What about panda bears? They’re cuddly looking. Especially young pandas. Yep, that sounds good. Toddler panda bears. That’d make a great ‘motivational poster’ for the break room, wouldn’t it? Some large guy turning away from a crowd with an angry look on his face, clearly yelling. Caption: Hey! Hold it down! We’re PRETENDING over here!. The critter that’s the neighborhood pain in the patoot is a 5.5 foot eastern diamondback. He always shows up when no hoe is handy or shotgun is within fetching distance. He only shows every few months and stays in a nearby wooded area, but he has caused some tight cheeks amongst humans and canines alike. Yikes! That’s not the kind of critter anybody wants to mess with! And I think I’d be happier to have the shotgun in hand than the hoe. Those rattlers are fast, and I’d like a bit more distance than the length of a hoe handle. Yep. Snake shot for pistols is, I think, number nine. But shotguns do ‘take the worry out of being close’ to borrow from an old deodorant commercial. For snakes, one has to be ‘up close and personal’ with pistols. That was from ABC Sports a few decades back. for me its moths, spiders and the like in mot bothered about they keep out of my way and I do the same, come too close and its a size 10 shoe for them. Ants are not my favorite creature and I think you may have just deepened my dislike. A million per person? Ew! I once experienced the biting ants after slathering all my exposed flesh (including my feet since I was wearing sandals) to a factor 30 SPF sunscreen. It declared itself to be fragrance-free so I bought it believing that it was less likely to attract the biting flys that are the most likely pest to distract me where I was planning to paint. I had a good start on the painting when I realized my feet were being bit by ants. Before too long I was doing a weird ant dance and not able to paint anymore and providing a huge distraction to my painting companion and neither of us could continue working. We had a look at the list of ingredients in the sunscreen. It had a lot of glycerin in it. What nincompoop decided that the recipe for a fun day in the sun includes serving up a sweet treat for the insect population? I think the whole gamut of biting insects could go and I wouldn’t miss them at all. Mosquitos, horseflies, ticks, ants, black flies, no-see-ems, you may keep them all. Mosquitos most of all. Those bites itch far too long and can keep you from sleep for days even if they aren’t doing a run near your ear just to let you know you sharing your sleeping space with them and are gonna be bit worse by morning. When I was a little girl I’d awaken to a body all scratched up from the bites suffered over the past few days. Since calamine lotion didn’t do diddly, the only other solution I could come up with was to try to get rid of any portion of my fingernails that could leave scratches on my skin. I’ve been a lifelong nail biter ever since. LOL! That’s a truly creative solution to scratching! And I agree with you wholeheartedly about mosquitoes and ticks et. al. There’s a mass extinction nobody would mourn. But glycerin in sunscreen? Agh! What were they thinking?!? I don’t like ants either. After the movie Naked Jungle (oldie) and the Indiana Jones Crystal Skull movie I may never let an ant live in my house either. I also don’t like large predators in my house. Everything that is outside should stay there. I have an odd antipathy to large predators in my house, too. Funny, that. And I definitely agree: if it’s outside, that’s where it belongs. This is bizarre, Diane. I’m back at work full time now, more or less, so my summer is just about over. Officially. More or less. Anyway, so basically my whole office is slowly undulating. Well, the office isn’t…maybe. But I wouldn’t actually swear to it. I mean, it’s college, right? Weird stuff happens now and again a college, right? So it might have actually been undulating. But I’m not gonna actually swear to it. But it coulda. Anyway, so every surface in my office is covered with little bitty ants that are busily going wherever they were going and doing whatever they were doing. The drawers were full of them, too, just so you know. Anyway, so I grabbed my trusty can of Raid and had at them! Started at the outside door a few feet from my office door at the end of the hall and sprayed that area then followed the wall to my office, all around the walls, shelves, assorted professor-stuff stacked and, er, piled here and there, then back out the door and to the next corner in the hall. Anyway, so I have an ant-free office today, and an industrial-strength fan running to air out the insecticide fumes.